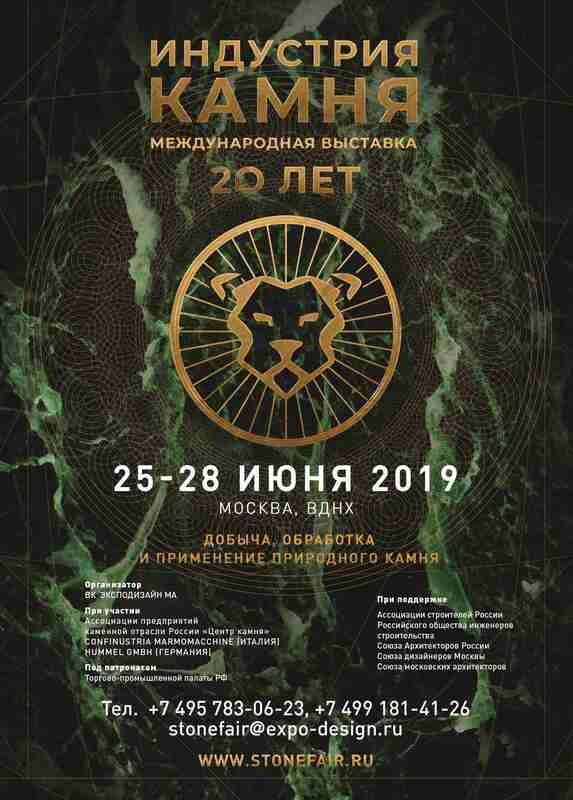 STONE INDUSTRY,the international exhibition for stone quarrying, processing and application which annually takes place in Moscow, Russia, in 2019 will celebrate its 20th anniversary. The exhibition was launched under the name EXPOSTONE in 1999 and since that has become the biggest international event for the natural stone industryin Russia and Eastern Europe. With 40 participants from mainly Russia and CIS countries in 1999 today the Exhibition gathers over 250 exhibitors from around 20 countries. Leaders in the global stone industry (China, Egypt, India, Iran, Italy, Turkey, etc.) are every year present by national pavilions which testifies that Russia is recognized as one of the major countries in stone quarrying andas well as one of the most promising markets. STONE INDUSTRY-2019 will showcase natural stone from main quarries in Russia and CIS - marble from Ural and Dagestan (Caucasus), granite andgabbro-diabasefrom Karelia (North of Russia), granite from Ukraine, Kazakhstan and Uzbekistan, limestone from Kyrgyzstan, travertine from Armeniaas well natural stone from Brazil, China, Finland, India, Iran, Italy, Montenegro, Portugal, Spain,South Africa, Turkeyetc. The exposition will include goods for exterior, interior and landscape design, tiles for facades, stone for pavement, stone artworks &decorative products, mosaics, grave monuments, as well as quarrying and stone processing machinery & equipment, engraving machines, hoisting devices, diamond, abrasive and carbide tools, chemicals for care & preservation of natural stone etc. STONE INDUSTRY-2019 will undoubtedly favour the development of international cooperation and will help participants and visitors to finds reliable partners and suppliers and to conclude profitable contracts.